121 of the 151 people, for whom a search and arrest warrant had been issued, were taken into custody in Diyarbakır on October 9. 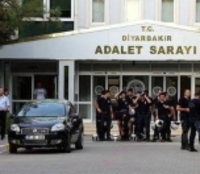 While 23 people were released after giving their testimonies at the Diyarbakır Security Directorate yesterday (October 10), 23 of the detained have been referred to the Diyarbakır Courthouse. As of 2.15 p.m. today, 98 people, eight of whom are journalists and the rest of whom are politicians, were still detained. Hilmi Aydoğdu, who is a member of the Democratic Society Congress (DTK) Co-Chairpersonship Council, was taken to hospital due to a heartache. After having an angiography, Aydoğdu was taken to the intensive care unit.